The Big R vs the Small r– What is Supply Chain Risk vs Resiliency? Risk vs. resiliency – The Big R vs. the Small r. Without formally defining SCRM, supply chain risks are hazards - something that can cause a loss or misfortune. From a supply chain standpoint then, any disruption that can stop the flow of product to customers is a risk because that has the potential to stop the inflow of revenue or greatly reduce profits. Risks are difficult to predict, and certainly it is very difficult to accurately characterize how a particular event might impact the supply chain. For example, back in 2010, not everyone looking at the probability of a volcanic eruption in Iceland would predict that it would cause airspace to shut down all over Europe for days… Government reaction, competitive action, media coverage and public opinion are a few wildcards that can determine how an event will play out. Resiliency is the ability to bounce back from misfortune or loss. From a supply chain standpoint, resiliency is a function of every day decisions that employees make throughout the enterprise on a daily basis to meet their respective cost, profit, revenue or time metrics. A commodity manager might change sourcing splits and direct larger volumes to a single source to get lower costs. Product design teams divert engineering resources who were qualifying a second source on a high revenue product so they can meet time to market goals. In order to complete a project on time and under budget, important safety and redundancy measures might be skipped. Executives wow analysts by moving manufacturing to low cost centers, generating record profits even as they drive down inventories to meet increasing turns targets – this results in stretched supply chains with no buffer to absorb disruptions. The examples are many and in each case, the seemingly everyday decision has the potential to reduce our ability to bounce back from a disruption. The point here is: resiliency is determined by these choices and the choice is within the organization’s direct control. Consider this… the perfect storm can form but if we chose not to linger in dangerous waters to increase our haul, we wouldn’t lose our nets - we would live to fish another day. Thus - Supply Chain resiliency Management (SCrM). Resiliency is within our control and therefore can and should be actively managed. The objective is not to put resiliency in direct conflict with other metrics, but to make resiliency a key consideration in making these decisions, i.e. making informed and resiliency optimized decisions. A resiliency-aware organization will still encounter the perfect storm. However, it will avoid the worst damage to the company’s stock price, brand, and reputation. It will enable the organization to get back up and march forward much faster than its competitors. Supply chain resiliency can become a competitive advantage, if only executives and practitioners embed this very important philosophy into the organizations’ DNA. So, take your pick—SCRM or SCrM? 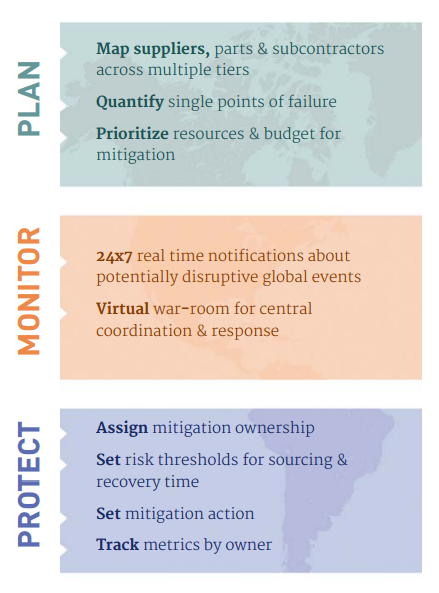 Make your supply chain resilient by learning to plan, monitor, and protect. Check out our whitepapers on resiliency in high tech, life sciences, and automotive.